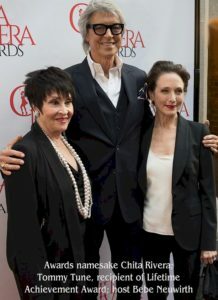 The first annual Chita Rivera Awards, named in honor of 10-time Tony nominee and two-time winner Chita Rivera, who rose from the gypsy ensemble to stardom and one of theater’s most loved personalties, celebrated dance and choreographic excellence. 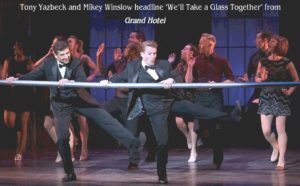 They were hosted by Tony Award winner Bebe Neuwirth, Monday at the Hirschfeld Theatre. 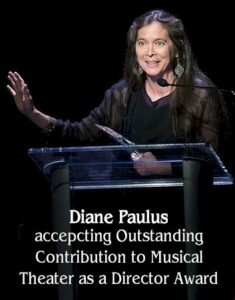 Tommy Tune was presented with the inaugural Lifetime Achievement Award; Diane Paulus with the Award for Outstanding Contribution to Musical Theater as Director; and entrepreneur Antonio Vendome with the award for Outstanding Contribution to the Arts and Humanity. Among theater notables making appearances were tony nominee Melissa Errico, Nikki M. James, Tony honoree Baayork Lee, veteran dancer Carmen de Lavaliade, Tony nominee Robert Fairchild, Tony winner and A Chorus Line nominee Priscilla Lopez, Tony winner Donna McKechnie, Chris Noth, Tony honoree and two-time nominee David Hyde Pierce, Tony nominee Lee Roy Reams, Tony nominee Sergio Trujillo, Tony-nominee Tony Yazback, four-time Tony winner Jerry Zaks, and four-time Tony nominee and Tony winner Karen Ziemba. 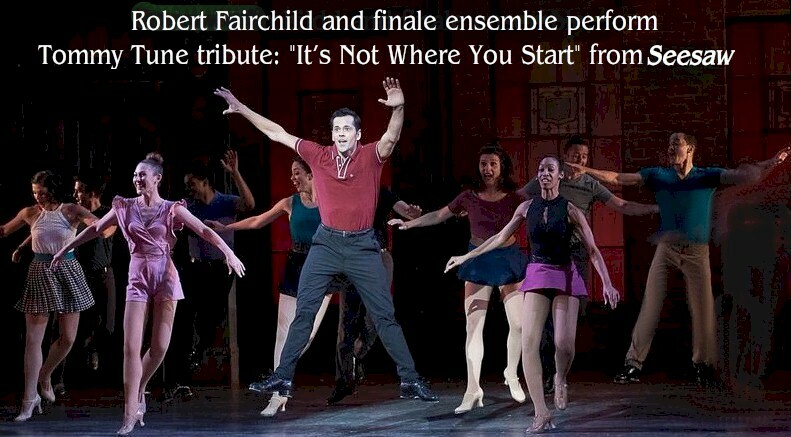 There were dance tributes to Rivera from the New York City Ballet, performing “America” from 1957’s West Side Story, her third original Broadway role and the one that first put her on the map, as the fiery Anita; American Dance Machine for the 21st Centrury; the Teen Company; and performances by the casts of A Bronx Tale , Tony-nominated Come from Away, and the recent Sweet Charity revival. 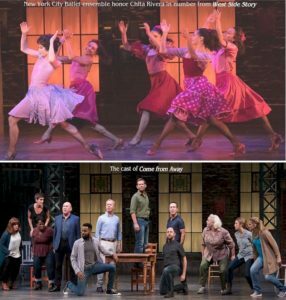 Nominators considered outstanding choreography, featured dancers and ensemble in shows on Broadway and Off Broadway, as well as, outstanding choreography in film, that opened in the 2016-2017 season. Nominations were determined by the designated nominating committees. The Chitas were directed by four-time Tony- nominee Randy Skinner and produced by American Dance Machine for the 21st Century (ADM21), producing artistic director, Nikki Feirt Atkins, in association with Patricia Watt. For more information, visit www.ChitaRiveraAwards.com.